Trade show retractable banners should be a core component of any brand's suite of promotional materials. In trade shows and expos, pull-up banner stands offer compelling brand messages that can fit into tight spots. They're also helpful throughout the year as you host prospective clients at your offices, hold self-hosted events, and run promotions that need added displays outside your storefront and more. At APG, you'll find a huge selection of trade show signs and retractable banner stand displays that can be customized to match your unique needs. Budget | Economy | $500 and More 23" - 25" | 31" - 32" | 36" - 37" | 39" - 42" | 47" - 48" | 59" - 60"
On this page you'll find our selection of professional retractable banners and pull-up banner stands. For over 30 years, APG Exhibits has been specializing in products that give our clients the competitive edge at trade shows and other industry functions. Given how much you invest in retractable banners and other trade show materials, as well as travel, it's important you maximize that investment. We understand the need for both high-quality products that deliver an excellent ROI and value pricing to meet the budgets of independent businesses in today's economy. Make the most of your investment of time, energy and money in trade shows and promotional materials when you lean on APG. Through our support and products, you can make the most of your brand message. Retractable and pull-up banner stands offer an easy way to add bold colors and graphics to any trade show exhibit area. The large canvas area naturally increases the visibility of your exhibit. Pull-up banner stands are easy to use and to transport, making your trade show experience more enjoyable. APG offers the most affordable banner stands anywhere without compromising quality. From indoor retractable banners to outdoor banners, we can help give you the solution you need. We have a special section for outdoor banners right here. All of our retractable and pull-up banner stands come with premium anti-curl graphics at no additional cost! Start promoting your brand and company with your own retractable banner stand today. Feel free to call or email us to connect immediately with a trade show display expert! At APG Exhibits we make it simple and affordable to design fully custom retractable banner stands of nearly any size needed. Preparing for a trade show or other exhibiting opportunity can be challenging and time-consuming, which is why we strive to make your job easier. Best of all, the pricing for our pull-up banner stands include all necessary hardware, a padded carry bag, and anti curl printed graphics. When you're pricing banner stands, be sure to check if all of the extras are included wherever you're shopping. They're not always part of the package. We believe in up-front pricing, and we work hard to offer the best prices in the trade show display industry. If you find any other banner stands we offer for less somewhere else, we'll beat it guaranteed. APG Exhibits proudly carries a large number of retractable banner stands to meet the needs of every company. Our clients include businesses of all sizes, from local mom-and-pop stores to large multinational corporations such as McDonalds. We bring our 30+ years of industry expertise to every order we fulfill, ensuring you get a retractable banner stand that's right for you and designed to stand out in a crowd. Your brand is unique, and no off-the-shelf retractable banner stand and design will serve its need. That’s why we offer a huge selection, as well as many customizable options. 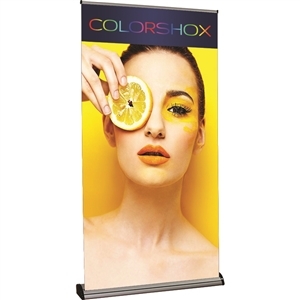 This allows you to achieve the look and feel you want out of a retractable banner with stand. A retractable banner stand should serve your brand’s needs — not the other way around. And our selection connects you with the right products to enhance your brand’s image and make connections with prospective customers. Please take a minute to review retractable banners and banner stands to see what will work for your trade show display. Place your order and in no time at all you'll have a new, more engaging trade show exhibit or retail store that's sure to build your brand and your client base. 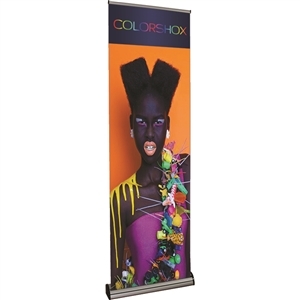 If you are looking for budget banner stands we have a separate section for discounted options. Remember, the more often you plan to use the stand, the higher quality we recommend. When you order a retractable banner stand from APG Exhibits, our primary concern is to deliver a product you are happy with. We will gladly print your artwork on any of our signage, making sure the print and color quality meets our high standards and fulfills your branding requirements. Our goal when working with clients on retractable banner stands and other projects is to make your life easier. Design isn’t just an afterthought at APG. Whether we’re working on a retractable banner or another type of display, we bring agency-quality design services combined with experience and knowledge in the trade show industry. Together, this skillset allows us to deliver high-quality designs for retractable banners that will help you achieve your goals and enhance your return on investment. Of course, not all of our clients come to us with a design in mind. For affordable custom artwork, our in-house specialists offer budget pricing of just $75/hour. With this exclusive customer rate, you can save hundreds over the cost of hiring an independent designer. Plus, our team works exclusively with APG Exhibits products and can create a design to the exact dimensions your retractable banner stand. Exhibiting at trade shows is an effective way to promote your products and services. Most attendees go to trade shows to learn about what's new. And many decision-makers find new products there. No other sales tactic reaches this same group of customers. The financial benefit of trade shows is undeniable. The cost of a face-to-face contact at a trade show or expo is $142. By contrast, visiting a prospect's office costs an average of $259. One study showed that for every dollar spent at a trade show, companies realize $4.99 in returns! But exhibiting at a trade show can also be an expensive undertaking. Trade show exhibitors can spend an average of $100 to $150 per square foot of exhibit space. So it’s no surprise that many business owners are looking for ways to reuse their materials. We’ve talked about ways to put your trade show materials to work after the show in the past. In this post, we'll focus on ways to keep your banner stands working after the show. Banners are one of the most popular elements of trade show displays. They’re lightweight, portable and easy to set up. They're also an ideal size for small spaces. With crisp, bold graphics, banners do a great job of attracting people to your expo space. Read on for more information on how to keep your banners and stands working after the expo. Trade show banners are an effective way to promote your services at a store or office. But designing a trade show banner that works in different places takes some effort. When you work with APG Exhibits on your banners, you’ll have access to banner templates. You can use these templates to create a compelling banner, design your own or work with one of our designers on a custom layout. Whether you work with our designers or create your own layout, these marketing tips can help you create effective banners. Customers today are bombarded with advertisements. A bold, eye-catching graphic will help your business stay in your customers’ minds. Many customers may only see your banners from cars. Other potential customers may see them in a crowded mall. Bold, relevant graphics encourage them to stop long enough to read the text. This approach also helps on crowded trade show floors. A bold banner, coupled with a memorable message, will draw in potential customers. Media stands are another way to make your promotions stand out. These stands are used to display electronic advertisements. If you use a media stand, make sure your advertisements are relevant and eye catching. At trade shows, prospects often stop to find out more about your products. You can include more information about features and values on your banners. If you plan to reuse your banners, stick with a simple, memorable message. Pair your message with bold colors and a unique design to make your banner stand out. If you’re using your banner stands to advertise sales and promotions or attract attention to your location, use a simple, memorable message. Pair your text with bold colors and a unique design to make your banner memorable. The same features that make your banner stand out a trade show will help attract customers in other locations. You can get away with more text if your banner will be part of a point-of-sale display. These banners can help to sell your products, even if a salesperson isn’t physically present. Including product features on your banner is a great way to engage customers. In a trade show exhibit, it's easy to use many banners that supplement each other. But when you use banners for other promotions, remember that customers may see only one banner. That's why it's important to keep your design and messaging consistent. Make sure these banners include your company's name, logo and location. Include other contact information on each banner if needed. Consistent messaging will help customers remember your promotion. When they see your banners elsewhere, they'll remember your company. Many businesses make the mistake of using low-quality graphics or fonts. Choosing a high-quality image is especially important if you're reusing banners. People are more likely to notice low-resolution images up close. Consider where people will view your banners. What is the light like? How far away will your viewers be? Would you like the text to stand out from nearby signs? We sometimes see banner designs where the text is too small for distance viewing. It's also common to see banners where the text and image blend together. Make sure your text is easy to read from a distance or in low light. We often see overcrowded banners with text that runs right up to the margin of a design. Review your design to make sure your message is clearly visible. If you’re unsure, widen the margins around your design. Some businesses think they’re wasting this “blank” space and add more detail to fill it in. White space can help your message stand out. It keeps your design from seeming busy or cluttered, and it can also create a classic or elegant appearance. Most importantly, it helps potential customers read and remember your message. Not all banner stands are the same. It's important to choose the right kind of stand, particularly if you'll use your banners outside of trade shows. Some banner stands, like spring-back models, are best suited to one-time or long-term use. Changing graphics on these stands can be difficult. They're best for occasional trade shows or long-term use in a lobby or office. Other stands, including pop-up and retractable models, are designed for regular use. Many of these stands include a carrying case to protect your banners during travel. Do you need to vary the height of your banner stands? How often do you need to move your banner stands? How easy does it need to be to set up your banner stands? Can you replace banner images easily? Below, we’ve highlighted several types of banner stands as well as banner stand uses outside of trade shows. Retractable banner stands are one of the most versatile types of stands. They’re a good choice for tight corners and small spaces. These stands vary in width from 24 to 60 inches. Multiple retractable stands can also be used to form a banner stand wall up to 96 inches wide. Look for a stand with a sturdy retracting mechanism if you plan to change banners often. Sturdier mechanisms will hold up longer and allow you to replace banners more easily. We also offer double-sided banner stands. These are helpful if you're planning to draw foot traffic in from a sidewalk. Each side can hold a separate banner. Double-sided banner stands provide 360-degree visibility, so pedestrians can see your signs from more directions. Stretch fabric banners are easy-to-assemble signs that travel well. Tabletop stretch banners are great for small spaces. These banners can help you stand out because of their unique shape. Stretch fabric banners can be curved or sloped. We even offer a shark fin-shaped fabric banner. Telescoping banner stands are a great choice if you frequently exhibit at trade shows. You can adjust the height to suit the space you’re in. Because you can adjust the size, they're also suitable for career fairs and conferences. These adjustable banner stands are one of the easiest stands to use if you plan to switch banners frequently. If you're new to using banners, consider a telescoping stand. It's common to see banner stands outside stores or restaurants. But some businesses have found unusual ways to reuse their stands. They've used them to solve problems ranging from lack of privacy to signage constraints. Others create unique artwork using multiple banners. Here are four unusual — and effective — uses for banner stands. Instead of a traditional trade show backdrop, consider using a series of banner stands. A trade show backdrop can cost between $1,000 and $5,000. Using a series of banners can be a more affordable way to make a big impact. You'll also be able to reuse the banners in other places or vary panels for different exhibit spaces. We offer a banner wall, which consists of three standing, connected panels. Together, they create a curved, eight-foot-wide wall. You can also use five or more banner stands to create a wider backdrop. Make sure your printer knows you plan to use the banners as a backdrop. They can print part of a graphic on each banner. This will create a seamless background image for your booth. Using banners to create a portable demonstration space is another unique idea. These spaces usually combine three or more banners with shelves. They create a convenient area where potential customers can try out a product. These demonstration areas are common at trade shows and point-of-sale areas. Since they offer privacy from nearby foot traffic, they're often used for electronics demonstrations. Many businesses use plain banners to create a demonstration space. But you can also put your demonstration space banners to work for you. Include product features, models or screenshots on these banners to highlight what's possible. Double-sided banner stands are particularly useful here. The outside banner draws potential customers to your demonstration booth, and the inside banner highlights features during your demonstration. Service companies are increasingly using banners as a way to advertise their services. For example, construction companies can use banner stands to showcase homes they've worked on. Banners that can highlight your work can be used in many different contexts. They're useful at trade shows, of course. But they're also valuable at career fairs or conferences. You can also use this type of panel in an office or lobby to showcase your work. If you plan to use banners in a single location, like an office or lobby, consider a spring-back banner stand. If you plan to move these panels frequently, look for a retractable stand with a case. You can also use banner stands to promote stores and restaurants. This is particularly useful if your landlord or city limits your shop's exterior signage. Your building may require exterior signs and awnings to use certain colors or fonts. Store signs can also be harder to see when a building is being renovated. Banners can expand your signage options. Because retractable banners are portable, you can use more advertising when you need it. And because of that portability, landlords are often more flexible about banners. You may also have a wider range of design and colors available with a banner. Shop banners can also double as directional signs. If your shop is in an out-of-the-way location, banners can help generate foot traffic. During renovations, they can give directions and remind customers that the shop is open. If you’re considering using banners or a banner wall to showcase your services, contact APG Exhibits to learn more about our design services. Our designers will help you create unique, memorable banner artwork. We also offer a wide range of banner stands. Whether you’re looking for an easy-to-assemble pop-up banner stand or a full banner wall for a trade show, we can help you find the equipment you need to promote your business. View our full collection of banner stands today!